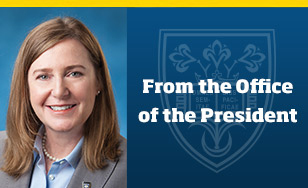 President Colette Geary shared this message regarding DACA with faculty, staff and students on Oct. 10. It was with profound disappointment that I learned of the recent decision to end the Deferred Action for Childhood Arrivals (DACA) program. Our Catholic, Benedictine values call us to respect, protect and support all members of our community, and in doing so, to uphold our institutional commitment to inclusion and diversity. The decision to end the DACA program has fostered deep feelings of fear and vulnerability among some of our students and members of their families. I am writing today to re-affirm the College's ongoing support of all of our students, especially those who are impacted by this decision. "At a time when all of our students should be excited about the start of a new school year, some fear expulsion from the only country they have ever known. They have grown up in our communities, been educated in our K-12 school systems, and have incredible potential to help our country grow economically ... DACA students are valued members of our college communities across Minnesota. They enrich and strengthen our campus with their intellect, their work ethic, and their service to our communities." You will likely recall that in December 2016, I also participated in the issuing of a statement of solidarity, along with over 70 other leaders of institutions of Catholic higher education, to voice our strong support for undocumented students and to urge the federal government to uphold the DACA program. DACA students are cherished members of our community, and they enrich our lives and our academic community. We will do all that we can to help them to realize their fullest potential and achieve their educational aspirations. As members of the St. Scholastica community, we must strive to animate our Benedictine values in everyday life: hospitality, our value of the year, focuses our attention on the needs of those around us, especially those who are most in need of our support. The College will continue to be actively engaged in following the activities and information available as related to DACA in the days ahead. We will also continue to provide appropriate advice and support to any of our students affected by this recent decision. The following staff serve as DACA resources: Chris Davila (cdavila@css.edu), Alison Champeaux (achampea@css.edu) and Teresa Aldach (taldach@css.edu).